Welcome to our sale page, an idea that has been waiting for a long time to come to life! Many times when we do custom orders, we will make up an extra piece here and there, and they accumulate very quickly. Finally, we are offering these and many others at deeply discounted prices when bought in larger quantities. As a religious mother, having boys, now men, who wear kippot 24/7, life was always a challenge on keeping kippot without losing them…. ( impossible I found). This page is perfect for that. 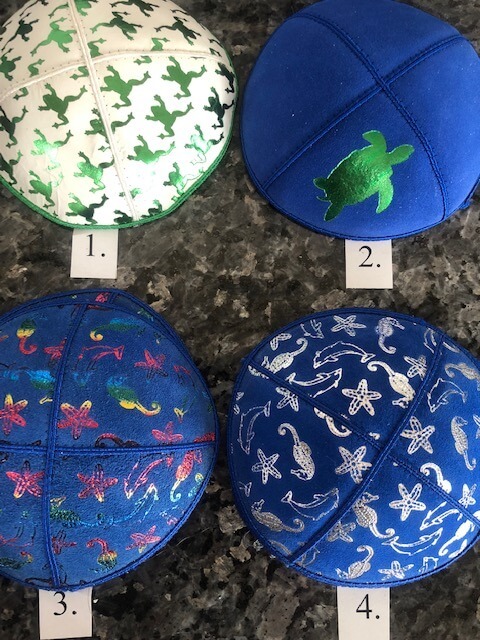 Grab 10, 20, 30, or more fun and unique kippot at such great prices, that you just won’t have to worry anymore! Following all the pictures, is a brief description of each numbered item if you want to know the exact colors etc. Some designs are single pieces, some have a few, and some have small quantities, so feel free to e mail us to find out. 189 Black suede with silver foil Lights Camera Action! 191 White suede with black foil Lights Camera Action! 364 **Assorted Satins, pricing may vary. 365 **Support Our Troups Velvet embroidered, pricing may vary. 371 ** Cloth Super Jew, pricing may vary.